Today’s challenge was the least stressful of them all. 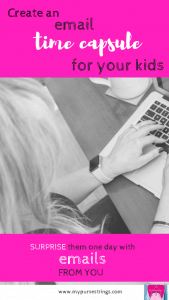 It took me all of two minutes to set up an email account for my kids, with the hardest part being finding an available username. There’s nothing like a completely clean slate. This is a screenshot of my son’s account. Think about this: one email, with zero responsibilities. He has no one waiting for a response. He’s not a part of any group emails. He’s not receiving any political jokes or semi-annual sale reminders. No paperless bills. Just one email. I decided to skip the sappiness (after all, I did just write a love letter yesterday), and instead, let them know the purpose of setting up the account. I have years of backtracking to do, but I intend to email them funny stories of their life so far, interesting conversations we’ve had, photos, etc. How many times have I thought, “Oh, I should write that down; it’s too funny,” and then convince myself that I will remember it. Only now that unforgettable memory sits somewhere in my cluttered brain, never to be discovered again. My inspiration for this challenge came from Google Chrome’s “Dear Sophie” campaign which aired the year my own Sophie was born. Turns out it’s against both Gmail and Yahoo’s policies to open an account for a minor child and they will block you if you try; I used my own birthdate. I likely won’t tell either of my kids about these accounts until they are much older. When they ready for their own personal accounts, I’ll sign them up for a completely separate one. Honestly, at this stage in his life, my son would be happy with WeirdoPants1@gmail.com. But, what an amazing day when they realize that both their parents, grandparents and other family members have been creating a chronological record of their memories through the years. On my end, I promise not to overdo it and spam their inbox with my thoughts. Seriously, what could be worse than mom-spam? In my initial email to them, I describe it as a “virtual memory box.” I’m pretty sure my neurotic self will occasionally print these emails as a back-up and put them in their real cardboard memory boxes. How do you keep track of your memories? FYI, I’m about seven years behind in creating my latest photo book. Speaking of memories, here is tomorrow’s challenge . . .
We really don’t have a lot of rituals in our family. This year, for a school assignment, my son had to write about one, excluding holidays. We had a rough time even thinking of one; so, he wrote about how every year on his birthday, we go to Stone Barns, a majestically beautiful local farm and we run around, playing in the fall leaves. It left me thinking: we should have more family rituals. Kids thrive on routine. 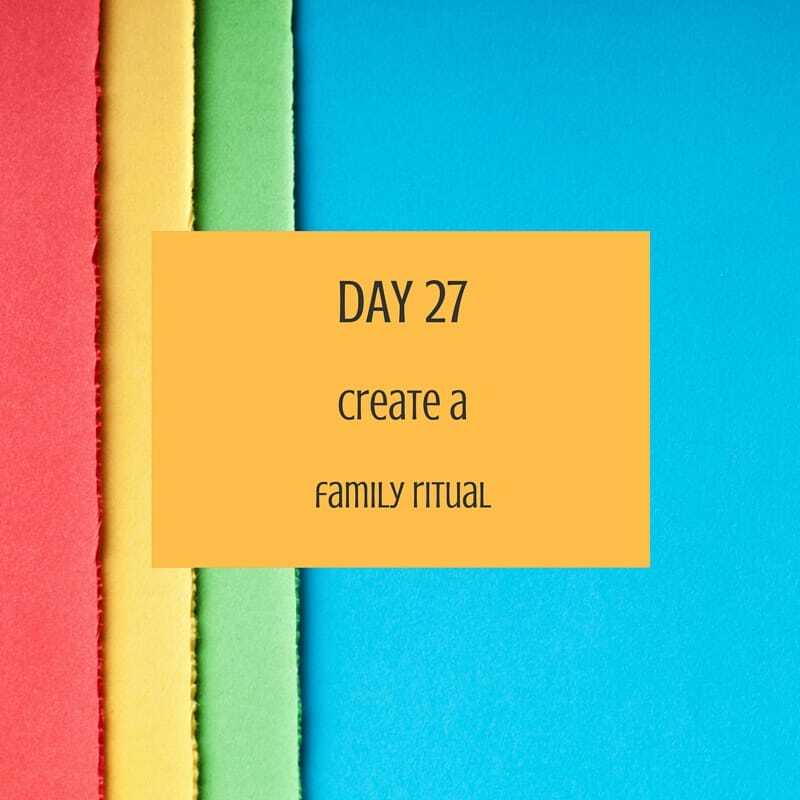 So, I’m challenging my family to do something together, maybe every Wednesday, the first Friday of every month, the first day of spring, or however often that we decide to conduct our little ritual.